Usually they are full of ingredients we will never use…..lots of oil, cheese, chicken, etc. But one day – I saw one that caught my eye – because it was pretty much Vegan already…. And let me tell you, it was just as easy to make as the video illustrated, and it was really good too! So here is my adaptation of a One Pot Mexican Couscous. 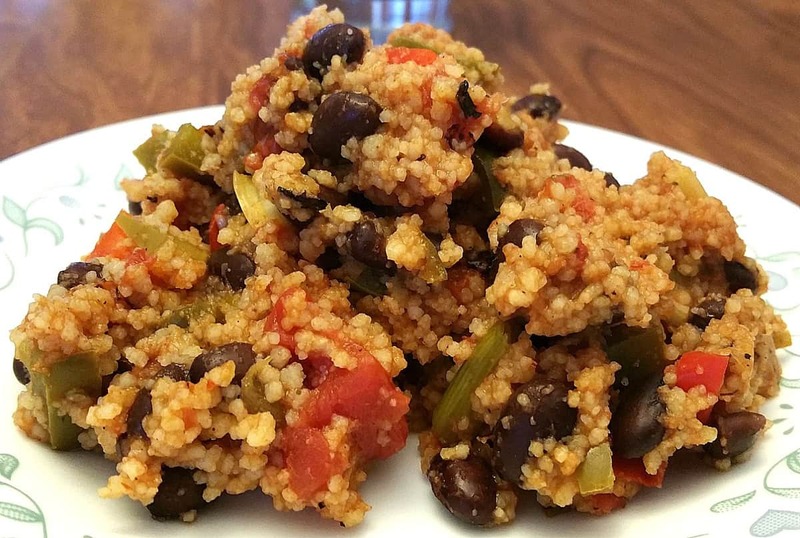 And yes – if you want to use Quinoa you can – I just happened to have some Couscous in my pantry so I used that. You will get a bigger nutritional bang for your buck using Quinoa – but use whatever you have. Couscous worked just fine. I even think Rice would work too. Ready for a no muss, no fuss, one pot, easy cleanup recipe? I thought so….. here we go. In a large pan, saute a few cloves of minced garlic, about 1/2 a red bell pepper, and a 1/2 a green bell pepper until softened. I used a small bunch of green onions too. And – just to spice it up a bit – I minced about 1/4 cup of pickled jalapeños too. (The mild kind). Once that has softened down, add a can of drained and rinsed black beans, and a can of fire roasted tomatoes. Give that a quick stir and add your spices. I used 2 Tbls of good quality salsa, about 1 tsp of chili powder, 1/2 tsp of ground cumin, and 1/4 tsp of Mexican oregano. Salt and pepper to taste. Now add 3/4 cup of Couscous (or quinoa) and 1 cup of low sodium veggie broth. Stir and bring to a boil, then lower the heat to med-low and cover. Let simmer 20 minutes and that’s it. Fluff with a fork and dinner’s ready. See? Simple and quick, and all in one pan. Salt and pepper to taste and season with additional salsa, cilantro, avocado, etc as desired. A tablespoon of Lime Juice adds a nice flavor too. Happy Holidays everyone! See you next week! 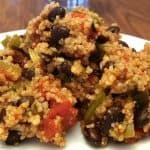 A quick and easy, One Pot Mexican Couscous. Ready in 20 minutes and only one pot to clean up! Super easy, McDougall Compliant, and 100% Fat Free. What is the serving size on this? We cook for the week and need to have an idea. Thanks! Tried to make this with 1 cup broth and it burned. No idea how many cups you really need but has the author ever made this himself?